Not being involved with long-term care (LTC) pharmacies much over the years, I sometimes forget that there’s technology to help with some of the day-to-day operations. I recently came across an advertisement for a company called Manchac Technologies. The reason it caught my eye is because I had a chance to visit with Manchac several years ago when they were still in their development stage. Manchac is a company out of Alexandria, LA that specializes in technology designed to automated blister card packaging called DOSIS. “DOSIS products are designed to enhance efficiencies in your pharmacy operations while reducing the opportunities for errors…a robotic solution that fully automates blister cards (filled, sealed, and patient-labeled)”. Blister cards – aka punch cards, blister packs, etc. – are still prominent in nursing homes and, therefore, a huge part of LTC pharmacies. Large operations will do thousands of blister cards daily. According to information on the DOSIS site, the companies new BP198 machine is “capable of producing 40-55 filled and sealed cards per hour”. I wonder how that production stacks up to a pharmacy technician, in both numbers of cards per hour and error rate? Maybe it’s just me, but those numbers appear to be low compared to what a good technician could do. The video below shows the BP198 technology from behind the scenes. The actual BP198 product appears to be contained in a cabinet about the size of a large high-speed packager, as you can see about 0:14 into the video. Like you, I have been following this company’s technology for some time. I thought I would add to your comments for those that might be interested in this topic. The original DOSIS product by Manchac, the L60, has been around for some time. 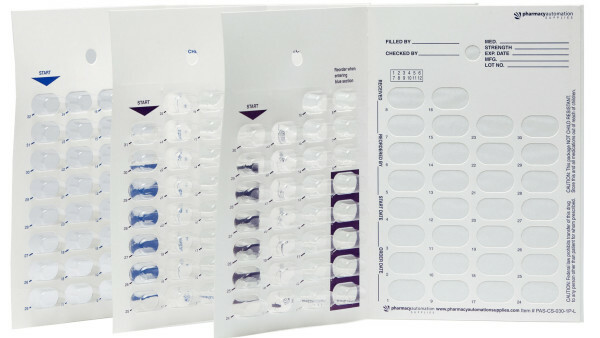 It is an automated, SINGLE-dose, blister card filling device (one pill per card location). The blister card pictures in your post are from this device. The device you show in the video is a new device that is being sold by another company in the US, Robotik Technologies, using technologies from Manchac (DOSIS) and Cretem, a Korean automated, pouch-packaging technology company. By combining automated packaging canister technology from Cretem (on the top) and the Manchac/DOSIS automated blister-card filling technology (on the bottom), Robotik has created a new automated, MULTI-dose, blister card filling device, the BP198. The Cretem technology drops the correct pills and the Manchac/DOSIS technology positions the empty blister card in the correct location to receive the pills for a given dose time period. I like the fact that they have taken two proven technologies to perform a new use (i.e., the multi-dose filling of blister cards). Omnicell has a new device in beta testing, the M5000, which is new hardware to automatically fill multi-dose blister cards. You will see the difference in technology when you compare the Robotik (http://bit.ly/240eAsi) versus Omnicell M5000 (http://bit.ly/1Pq4ERc) videos. Two different ways to automate the filling of multi-dose blister cards.